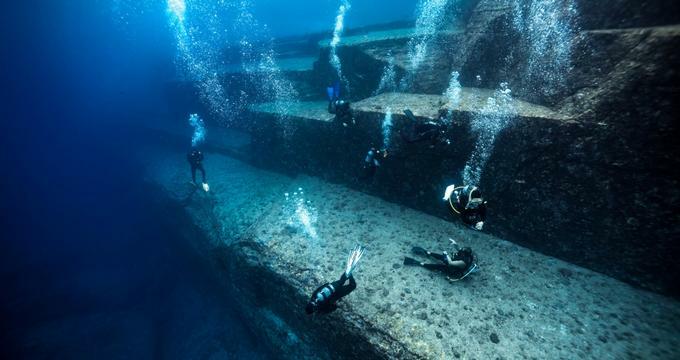 The Yonaguni Monument is a rock formation submerged off the coast of the southernmost Ryukyu Islands in Japan. It was first discovered by Kihachiro Aratake in 1987 and has since been visited by scientists and dive enthusiasts alike, trying to get to the bottom of the site’s mysterious origins. Described by some as the Japanese Atlantis, there appear to be several clearly manmade structures submerged under the ocean here. The largest of these structures is a stepped pyramid that rises from the ocean floor to a height of around 25 meters. Masaaki Kimura, a marine geologist from the University of the Ryukyus, has dived the site more than 100 times and has identified 10 unique structures spanning an area of 300 by 150 meters. He has also earmarked a further 5 structures possibly linked to the main site, located off the coast of the main island of Okinawa. He is convinced that what has been found is the remains of an ancient city that sunk, possibly due to seismic events. He believes it would be very difficult to explain away their origin as not being manmade due to the vast amount of evidence of man’s influence on the structures. He has also suggested that these monuments may well be the missing link to the ancient lost civilization of Mu. There is considerable debate concerning whether the site being man-made, man-modified, or completely natural and strong arguments are made on either side. Neither the government of Okinawa Prefecture nor the Japanese Agency for Cultural Affairs recognizes the site as important, and neither carry out preservation work or research at the site. The main point of contention is that a great deal of the lesser structures could just be explained by the fine sandstone cracking naturally along fault lines to create the resemblance of manmade straight lines and geometry. Professor of Oceanic Geoscience at the University of the South Pacific, Patrick D. Nunn, has studied the formations extensively. He has concluded that there is no reason to suppose them to be artificial, his main observation being that similar formations continue above water in the Sanninudai slate cliffs, and these occur completely naturally. Whether they are manmade or natural is likely to continue to be subject to debate well into the future, with no bodies stepping forward to conduct serious official studies or surveys. The island of Yonaguni remains a fantastic tourist attraction and this unsolved mystery only adds to that appeal. The reason the structures were discovered in the first place is in large part due to the area being a famous diving spot for those hoping to observe the great numbers of hammerhead sharks in the area. Perhaps you should suit up and dive down to the monument and decide whether it’s natural or artificial yourself. The sight of the submerged formation is breathtaking either way and you’re sure of a scenic sea view.